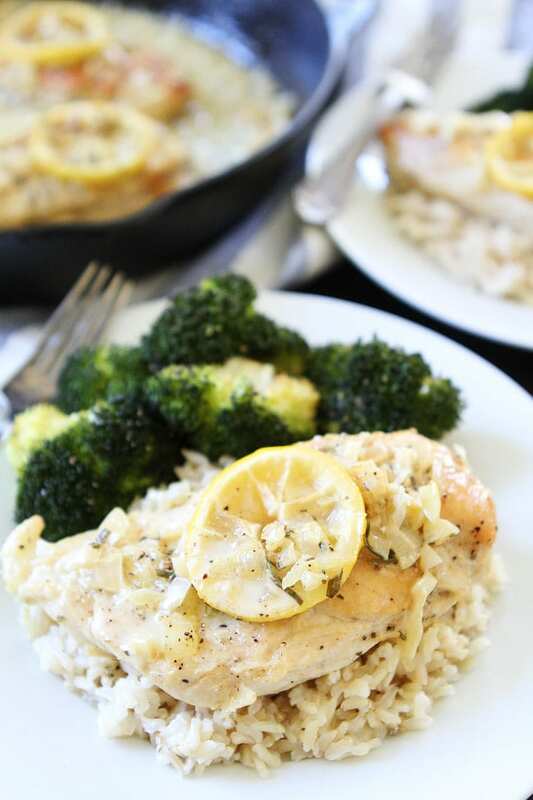 Skillet Creamy Lemon Rosemary Chicken-this quick and easy one-skillet chicken dish is great for busy weeknights or easy entertaining. 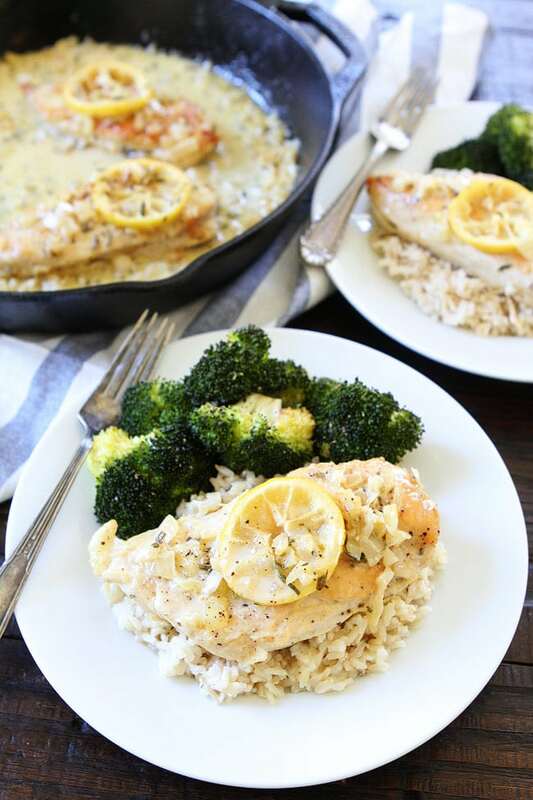 One of Josh’s favorite recipes to make is this easy Skillet Creamy Lemon Rosemary Chicken. It is one of his staples. I get out of the way when this chicken dish is on the menu. I don’t leave the kitchen, but I let Josh take control because this recipe is his specialty. I make the rice and veggies while Josh takes care of the chicken. Josh loves this chicken dish because it is full of flavor and made in ONE skillet. It is so easy! 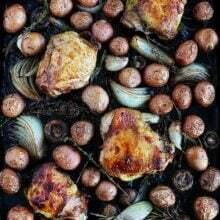 The chicken is cooked on the stove and finished off in the oven, so make sure you use an ovenproof skillet. Josh likes to use his favorite cast iron skillet. 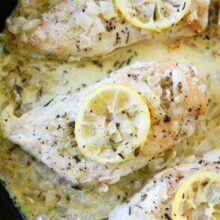 The chicken comes out juicy and tender, every time and you will LOVE the simple creamy lemon rosemary sauce. It is so good you will want to lick your plate clean! Josh usually does, he claims it makes doing the dishes easier. I can’t complain because he does the dishes. Don’t worry, I make sure he sticks his clean plate in the dishwasher. He is not allowed to put it back in the cabinet just because he licked it clean..ha! 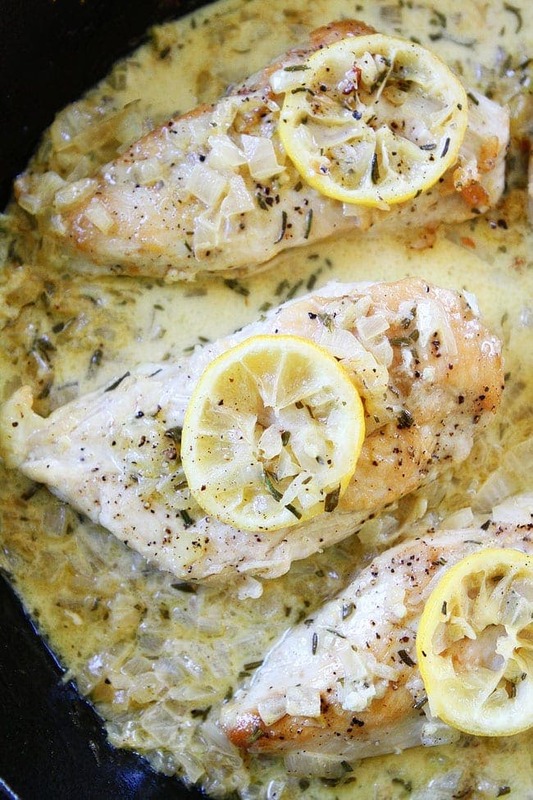 Add this Skillet Creamy Lemon Rosemary Chicken to your dinner menu NOW! It really is a winner winner chicken dinner! 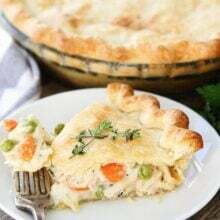 This quick and easy one-skillet chicken dish is great for busy weeknights or easy entertaining. It is a family favorite! 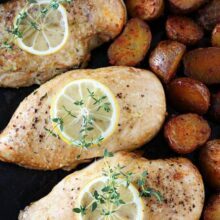 Place the chicken breasts on a cutting board and pound until they are the same size and thickness. You want the chicken breasts the same size so they will cook evenly. Season chicken with salt and pepper. In a large ovenproof skillet, heat the olive oil over medium-high heat. Add the chicken breasts and cook for 4 minutes. Flip the chicken and cook for 4 more minutes. Remove the chicken from the skillet and place on a plate. Cover with foil and set aside. Note-the chicken should be browned, but not cooked all of the way. It will finish cooking in the oven. Turn off the stove, but leave the skillet on the stove. Zest one of the lemons. Add the lemon zest to the skillet. Juice the lemon and add the juice to the skillet. Stir in the broth, onion, garlic, and rosemary. Slice the remaining lemon and add the lemon slices to the skillet. Turn the stove to medium-high heat and cook, stirring the sauce to scrape up the browned bits from the bottom of the skillet. Bring the sauce to a boil. Gently boil for 8-10 minutes so the liquid can reduce to about 1/4 cup. Reduce heat to low and stir in the heavy cream and butter. Cook until the butter is melted, about 2 minutes. Add the chicken breasts back to the skillet. Place the skillet in the oven and bake uncovered until the chicken is completely cooked through, about 8-10 minutes. Remove skillet from the oven and serve chicken with sauce spooned on top. We like to serve the chicken and sauce with rice and roasted broccoli on the side. Note-the chicken will keep in the refrigerator for up to 3 days. Reheat in the microwave. Oops! Could you please correct the ingredient list where it says 1/4 tablespoons? Thanks! Done! Thanks for catching that! Obsessing over that creamy sauce!! Love simple, yummy dinners like this that are perfect for weeknights! I bet this tastes so good! 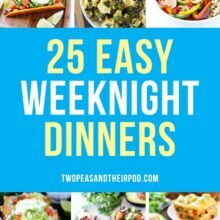 what a perfect weeknight dinner! That’s some tasty looking chicken! Will be trying this soon! Looks great! Maria, this cream sauce looks amazing!! This looks AMAZING. Thanks for the inspiration! super delicious! 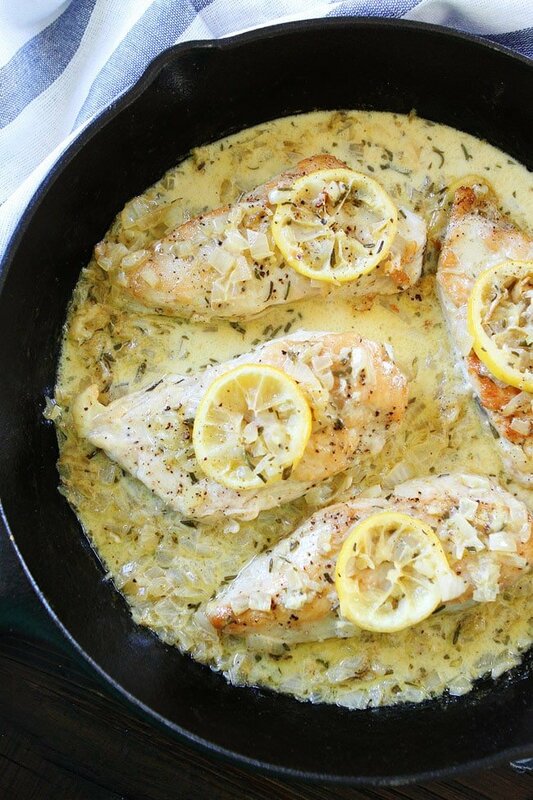 i LOVE lemon chicken! and the creamy sauce… my mouth is watering! Mmmm Lemon anything works for me! Made tonight. Even after pounding, my grocery store bought giant chickens took 25 minutes to finish the oven. It was really good though! Never time i think I’ll cut the breasts in half. The sauce was delicious! I want this yummy chicken dish for dinner tonight! Yes, stock will work too! It was a good and easy meal, and the sauce was nice and light. I love lemon and rosemary! I cut the chicken in half horizontally, so the cooking times were a bit shorter (both in skillet and in oven). The sauce was good, although I would use the juice from half a lemon next time. This looks delicious. I think I’ll be licking the plate clean too with that sauce, oh it looks so good. I wish I had it in front of me right now. I’ll cook it for dinner tomorrow night. Thanks for sharing. I made this last night for my boyfriend who is a professional chef. His first response wasn’t words, just the sound “Mmmm!” and he went back for a second helping! I love any chance to impress him with easy and quick meals. Love your recipes! Thank you! Could I use milk instead of the cream? It won’t be as rich and creamy, but probably still good. 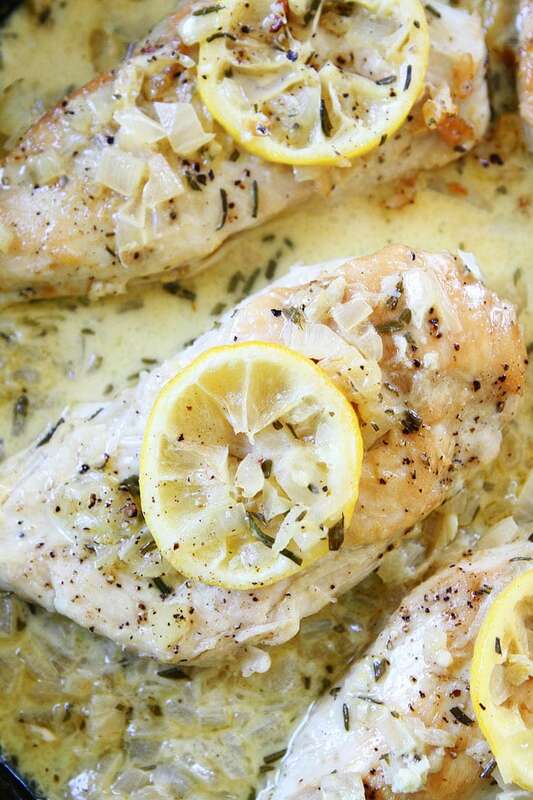 I’ve made countless lemon and rosemary chicken recipes and was always left disappointed. This one was a winner! I had no idea such simple ingredients could make so much flavor, but we devoured it last night and it’s already back on the meal plan. THANK YOU for restoring my faith in lemon rosemary recipes! I made this for dinner last nite, super ez and it was so delish! Thank you for sharing! Just made this tonight and it was very easy and very good!! Hi Maria and Josh! Thank you so much for all the wonderful recipes. I am slowly working my way through them, and so grateful to have them. Can this be done ahead of time? Made this last night and it was seriously delicious. The sauce is wonderful!! I will definitely make this again soon.